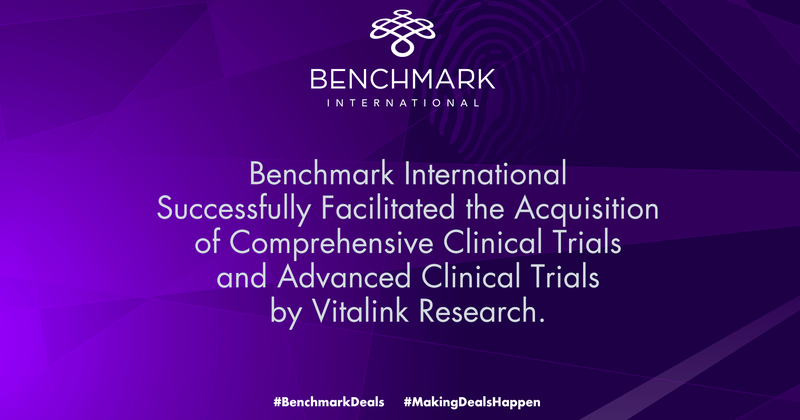 Benchmark International has successfully facilitated the acquisition of Comprehensive Clinical Trials, LLC and Advanced Clinical Trials, LLC (hereinafter referred to as CCT) by Vitalink Research, LLC. (hereinafter referred to as Vitalink). CCT is an accomplished clinical research site specializing in conducting Phase II - IV clinical trials. It serves over 400 sponsors ranging from small biotech companies to the world's largest pharmaceutical and medical device companies and has completed hundreds of trials. Vitalink is a US network of fully integrated clinical trial sites, connects world-class physicians and medical professionals with site managers and research coordinators to set the standard for the timely execution of clinical trial protocols with trustworthy results across all sites. “I’m very excited for both CCT and VitaLink for consummating this partnership. As with every deal, this transaction faced a small number of issues through the diligence process. Thankfully, both sides had practiced professionals which allowed us to work through the various issues and find a way to make both sides happy. With this acquisition, VitaLink will break into theWomen’s Health sector with a major statement. 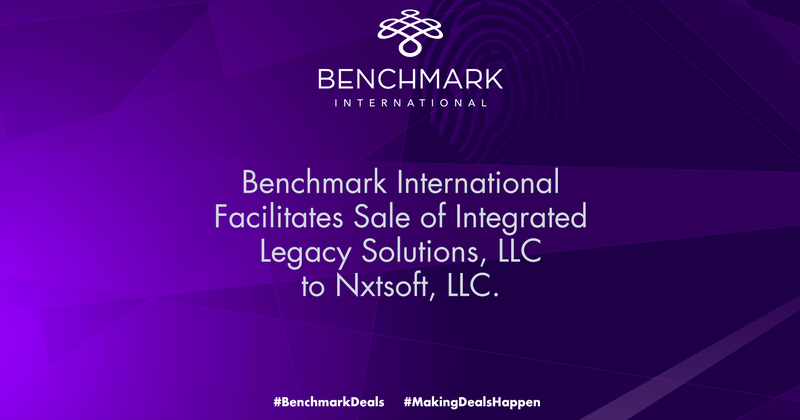 Through the leadership of Dr. Ackerman, Vitalink will quickly become a widely recognized leader in this highly specialized study area.” said Benchmark International Associate Transaction Director David Steverson. When selling your business, dealing with the various types of buyers present in today’s market is both a curse and a blessing. It’s a blessing in that, aspects of your business that may not appeal to a certain buyer type may appeal to, or at least not be an issue with, other types of buyers. But a hundred different curses almost offset this large benefit. What do different buyers prioritize? How do you appeal to two or more different types of buyers at the same time? How do different buyer types run their decision-making processes? Which buyer types should you pursue? How do you even know what type of buyer you are dealing with? In a world with only one type of buyer, the company sale process is greatly simplified. They might all like to hear the company’s story the same way. 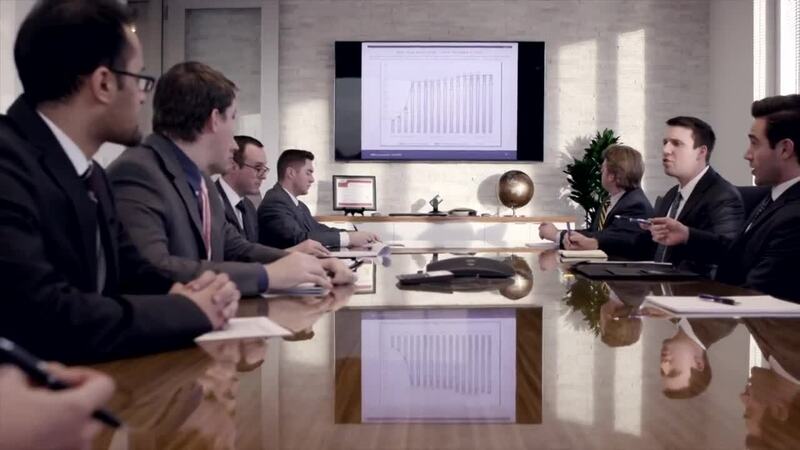 They might look at the financial statements the same way. They might all operate on the same timeline with the same seasonal variations. And, they might even be susceptible to being found in the same place from time to time. 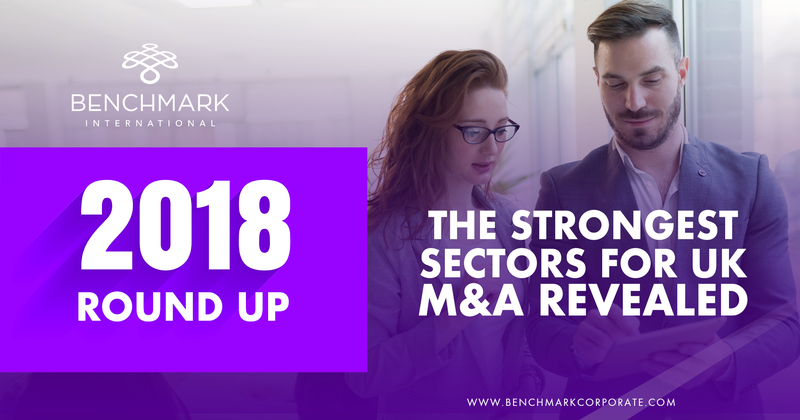 But, what is currently driving the robustness of today’s M&A markets are in fact the imbalance between the number of buyers and the number of sellers in the arena. And this, in turn, is largely driven by the increasing diversity of buyer types now competing with one another for that limited supply of opportunities. In today’s market, one of the worst moves a seller can make is to market to only one type of buyer or, even worse, run a process expressly excluding one or more types of buyers. The success of any current sale process relies on a much more sophisticated approach to marketing, than was the case a decade ago - one that catches the interest of all buyer groups simultaneously and excites them for the opportunity to investigate further. The first step in exploiting this development is to identify the strengths, weaknesses, and priorities of the various buyer types. 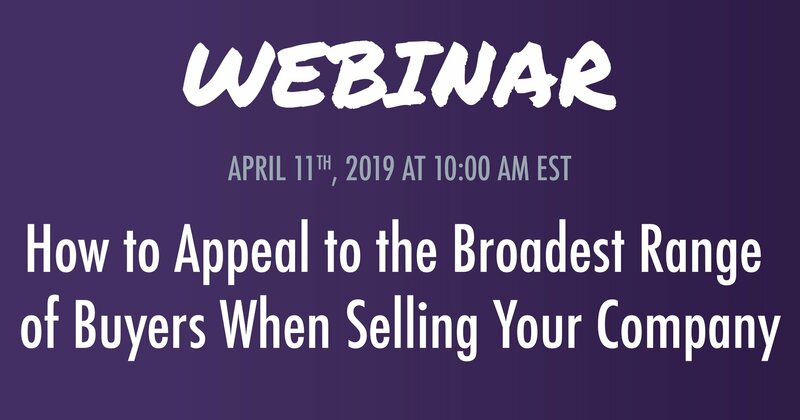 This webinar will start with this analysis and then move quickly onto strategies for playing to various buyer characteristics. International expansion allows access to new markets and a greater reach to more of these consumers, thus increasing sales. While this can be achieved by establishing a branch or subsidiary, a merger or acquisition could save time and money spent on starting a business from scratch. Partnering with a company in a smaller country can be particularly fruitful, as the smaller the country, the larger the access to its market. An advantage of an international merger or acquisition is a wider range of services or products can be explored. This helps a business in diversifying their assets, protecting the bottom line against unforeseen circumstances. For instance, companies with international operations can offset negative growth in one market by operating successfully in another. Companies can also utilise international markets to introduce unique products and services, which can help maintain a positive revenue stream. For example, Coca-Cola diversifies through global operations and recently reported increased sales in China, India and South Korea, which benefited Coca-Cola worldwide. One of the conditions for merging with, or acquiring, another company is to retain the staff and integrate them in the new company, which are legal requirements imposed by national and international regulations. The benefit is that international labour can offer companies unique advantages in terms of increased productivity, advanced language skills, diverse educational backgrounds and more. Due diligence is a buyer’s detailed investigation into the matters of your company in preparation for a possible sale transaction. For many business owners, this is one of the most dreaded parts of selling their business. After a letter of intent (LOI) is signed and a price range is agreed to, buyers have the right to dig into the business to ensure that they know what they are buying, and to identify any potential risks of owning the business. While buyers and sellers have different objectives and motives, both parties benefit from a thorough and efficient processes. Whether your company is pursuing a capital infusion or positioning itself for an acquisition by a strategic or financial buyer, due diligence is a critical component of every investment. It’s an intrusive process and, like everything else about the sale of your business, you need to be prepared. When a potential buyer assesses your company, they will want to fully understand the essentials of the business such as organizational information, financial records, regulatory matters and litigation, employment and labor matters, and many others. 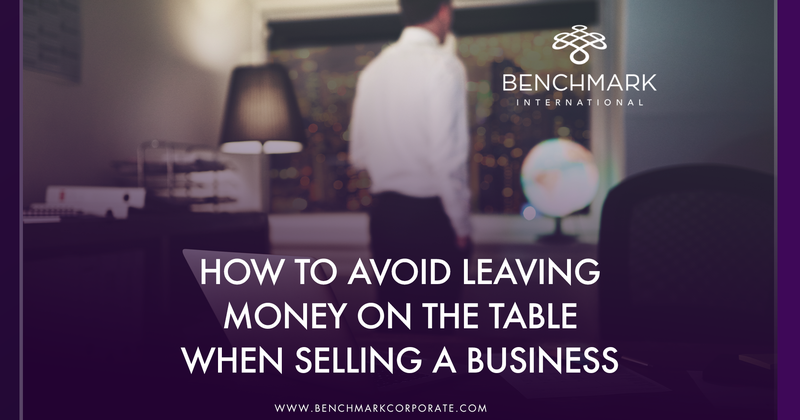 When your company is well-prepared for the exit process, long before it is anticipated, not only will it make the company look more attractive to potential buyers but it will also maximize the value and expedite the transaction timeline. If not properly prepared, this can result in an incredible demand on a company and its resources, give a buyer the perception that the company is disorganized, and create operational difficulties within the company. Most buyers will provide the target company with a due diligence checklist but, before receiving that list, sellers should ensure that common checklist items are available, up-to-date, accurate, and organized. The data needed for the due diligence process should be in order and ready to be uploaded to a virtual data room within a couple of days of initiating due diligence. This is not only necessary in the event of an acquisition, but it is also a valuable discipline to maintain as the company grows. 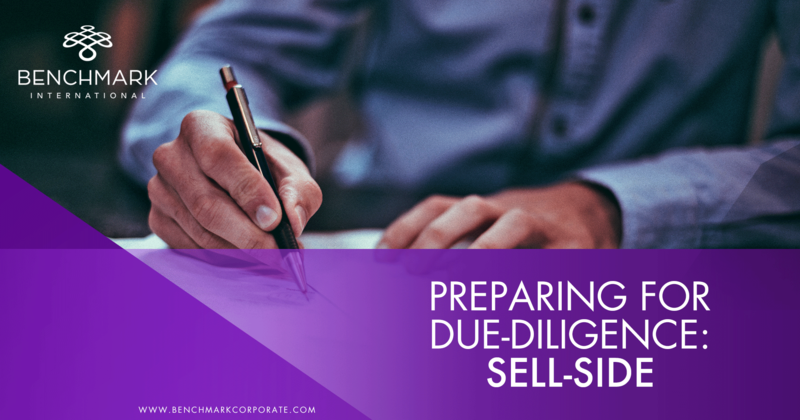 The due diligence process is dependent upon the strength of the seller’s accounting system. It is essential that the company’s financial reports present potential buyers with a clear story, allowing them to fully evaluate the company’s earning potential. Buyers will be concerned with all of the target company’s historical financial statements and related financial metrics, as well as the reasonableness of the projections of its future performance. A business’ financial records should be clearly stated and easy to follow. If not, this could create confusion, misunderstanding, and devaluation. Planned transactions have failed, even though the business itself was healthy and growing, when the financial reporting was outdated, inaccurate, or incomplete, and the buyer could not trust the data. Accurate financial statements are also necessary for the seller to support the business valuation. What assets does the business have? How profitable is the business? What is the working capital? What are the growth trends? All of these are major factors in the valuation of the business, so the data representing them needs to be accurate and precise. To avoid issues, it is recommended that, before going to market, a seller contacts an independent accounting firm to review or audit the company’s financial statements. This will help to ensure that the company financial data is accurate and complete, will instill a sense of confidence from the buyer, and will more likely result in an efficient and successful due diligence process. A team of good professional advisors is crucial to a successful sale of a company. These advisors will steer sellers in terms of what they need to do to get their company ready for sale. 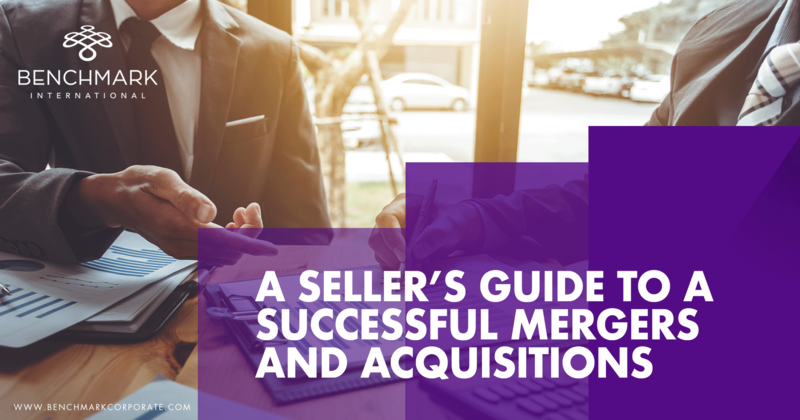 Tap into these resources because they will have dealt with enough transactions to know what you should be focusing on to ensure a successful sale. Some recommended professional advisors include, but are not limited to, a M&A broker, an accountant, a tax advisor, a M&A lawyer, a wealth advisor, an investment banker, and a trusts and estate lawyer, if needed. With advance planning and the help of good advisors, a seller can ensure that his or her best interests are fully represented, common pitfalls are avoided, and the transaction will run smoothly and efficiently. During the due diligence process, potential buyers will seek to comprehensively understand the business practices behind a company’s earnings. It is the sellers job to guide the buyer through the learning curve. Respond to the buyer’s due diligence requests in an organized, detailed, and complete manner. If there are requests for missing data, respond punctually. This responsiveness allows the seller to gain credibility with a buyer, and provides buyers additional comfort with the quality of the business they are buying. Due diligence is a vital and complex part of M&A transactions. Preparing beforehand can help a company position itself for higher valuations, stronger negotiations, and better outcomes. Understanding the importance of due diligence to both parties in a transaction, planning in advance, enlisting the support of specialists, and investing the time to run a thorough due diligence review early in a transaction will help prevent unwelcome surprises and potential liabilities for both parties. Maybe you are a lot like Sam. Sam has been working at a job that he doesn’t love, going to work each day and feeling unfulfilled. Sam would really like to quit and go into business for himself but he has a wife and a child to support. This leaves him with a big decision to make; should he start a business or buy an existing one? As Sam does his research, he discovers the many factors that will influence his decision. Sam, like many of us, has a family to support so most important to him is to have sufficient income to continue supporting his family. Taking on the risk of possibly not generating any income for several years with a startup is not a realistic option for Sam. 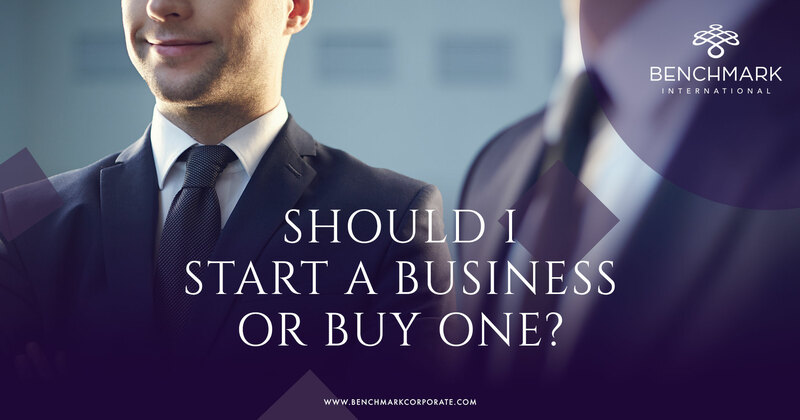 Since starting up is not an option for Sam, buying an existing business will allow him to have the necessary cash flow from day one as he will be taking a salary directly from his business. In addition, depending on the way he chooses to acquire his new business he will be able to keep investing back into the business so it can continue to grow. While Sam understands that there will be many headaches and long days because of his new business owners he will be free to be his own boss. Furthermore, this new business will likely relieve a lot of the financial stress that he currently has as his family’s expenses continues to grow. Like most people going into business for themselves, Sam will need to secure financing and/or attract investors to help him get started. He quickly learns that banks and investors strongly prefer dealing or lending to a business that has a proven track record and strong historic financial performance rather than a higher risk start up business with so many uncertain factors such as high debt, or customer concentrations. 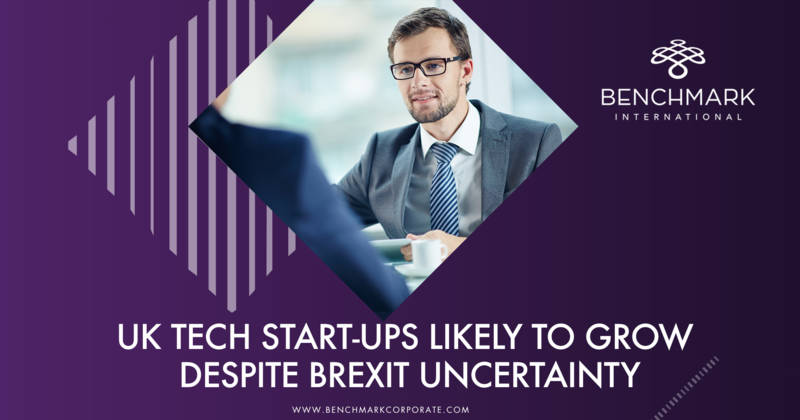 With the right guidance from a reputable M&A firm such as Benchmark International, Sam will be able to find financing to be on his way to fulfilling his dream of business ownership. Like many young entrepreneurs, Sam is excited and motivated by the idea of growing a business. He understands that there is a marketplace for businesses he is currently looking for and is much less interested in the grueling legwork and struggle of getting one up and running. He knows that buying a business will give him an established brand that has been tried and tested along with any patents, copyrights and valuable legal rights that may come with that. Having acquired a business, rather than starting one, will have be doing the work he is most passionate about from day one. Sam’s wife Helen is a very active member in their community and their home is usually filled with family and friends. Like many of us, friends and family are very important to Sam and he wants to make sure he will still have time for those things and does not miss out. Sam is especially enthusiastic about four children’s school activities. He realizes that by buying an existing business, he will have an established vendor, customer base, goodwill, equipment and suppliers. Things he would otherwise need to spend countless hours acquiring. Sam will also have an experienced and trained staff in place ready to go that will know and understand the business so he can take a couple of hours and see his children flourish. The seller has spent time teaching and training those people and Sam will reap the benefits of that. From day one, he will have people in place who are able to help run the business and teach him things while he gets settled in. Sam understands the target business and he knows that with a few tweaks and changes here and there it will be running the way he wants to in no time. While at the same time being able to spend the evenings at home with his wife and kids. Business ownership may seem like a daunting thought but it really should not be that hard. Sam’s experience shows us some of the things to think about when making such an important life decision. So, what about you? Are those advantages important to you as well? Do you have a unique idea that may be easier to get off the ground by incorporating it into an existing business? 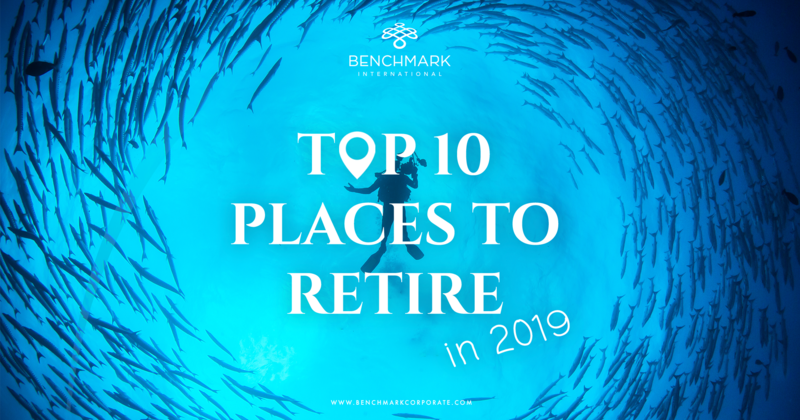 As we move into a time where more and more baby boomers are looking to retire and sell their businesses, the opportunities are endless for budding entrepreneurs. Your time may be now! And what happened to Sam you wonder? Sam did make the decision to purchase an existing store rather than start his own and was very successful in growing it. In fact, Sam Walton grew his Wal-Mart stores to be the largest retail chain in the United States. What business will you grow? 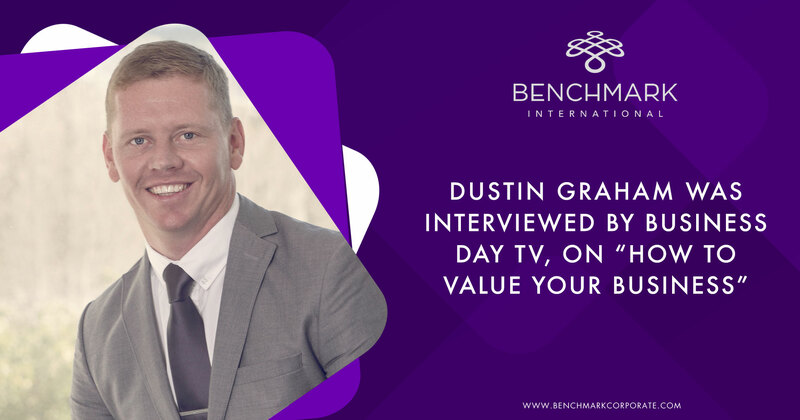 Business Day TV is broadcast on Channel 412 on DStv and is available to over 10-million viewers in 9 countries across Southern Africa. It is one of three TV stations owned by The African Business Channel. ABC is owned by SA’s leading financial publisher BDFM, publisher of Business Day and Financial Mail. BDFM in turn is owned by the Times Media Group, one of SA’s largest media houses. One of Business Day TV’s strengths is its access to content from this extensive network. Most business owners have become acutely aware of how a change in interest rates can impact their financing decisions. Whether it means taking advantage of a competitive rate and refinancing previous notes or whether it means holding off on acquiring a needed piece of equipment until the monthly payment becomes more manageable; the interest rate associated with obtaining debt can play a major role in the decisions a business owner makes in the day-to-day operations of their company. 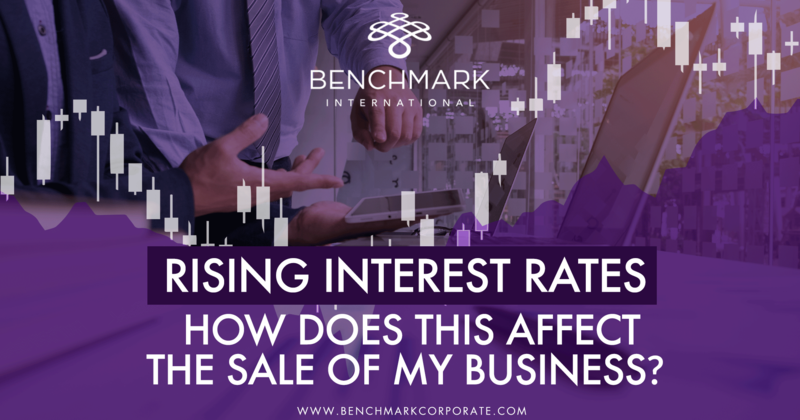 But, how do interest rates impact the sale of a business? Is there a correlating relationship between interest rates and activity in the M&A market? If there is, what is the importance of timing the sale of a business based on the indications provided by the Federal Reserve? 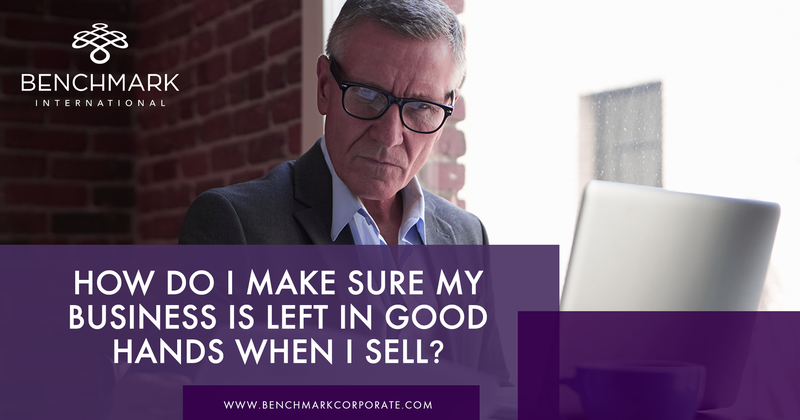 All of these questions are important to consider as a business owner begins to contemplate the potential sale of their company. The Federal Reserve has indicated that it is planning on increasing interest rates as it is continuing to pull back from its decade-long effort to stimulate economic growth. As of November, 2018, the Wall Street Journal Prime Rate was 5.25% whereas one year prior it was 4.25%. This metric is important as it consists of a survey of the 30 largest banks and is the rate at which banks will lend money to their most credit worthy customers; additionally, this rate will move up or down in lock step with changes made by the Federal Reserve Board. So, what does this mean for those who are in the market to sell their business? An increase in the federal funds rate increases the cost of borrowing and hence affects the value of merger deals, especially if a portion of the transaction is being financed through loans. If the company to be acquired is highly leveraged and the cost of debt goes up, the internal rate of return is impacted, lowering the valuation of the company. 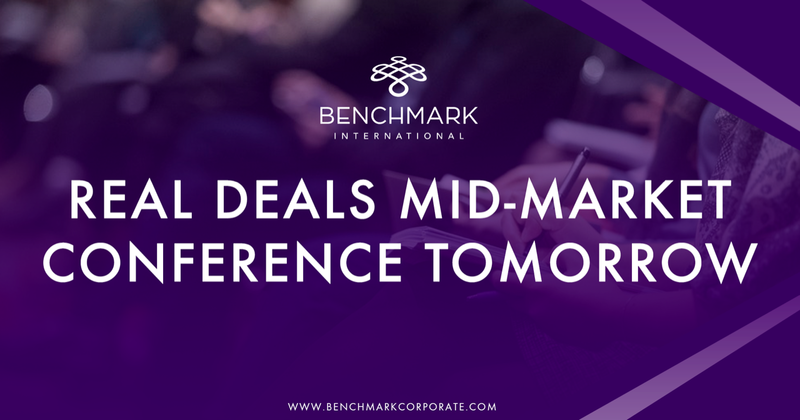 The timing of when a business enters the open market for sale as well as the speed at which interest rates rise also plays a role in the impact that interest rates have on activity in the M&A market. A methodical rise combined with a strengthening economy, which the United States has experienced over the past 18 months, should not have a detrimental impact on the aggressiveness with which buyers enter the acquisition market. The reason that a controlled and steady increase in interest rates mitigates the risk associated with increased cost of debt has to do with the corresponding increase in corporate confidence. With interest rates having been at historical lows over the past several years, many companies in the market to buy are armed with strong balance sheets earned via normal operations of the business as well as having taken advantage of low market interest rates to issue debt. This cash held on the balance sheets of acquirers in the market may deflect some of the increase in borrowing cost due to the availability of deployable capital. Specifically addressing those sellers looking to sell a business in the middle to lower middle market space – a slow rise in rates will give them an opportunity to cash out and use this new-found liquidity to put their money back to work in a recovering and dynamic market. In conclusion, the general consensus is that rising interest rates aren’t going to put a damper on mergers and acquisitions activity, at least not in the near-term. However, as interest rates continue to increase, there will come a time when the increased cost of borrowing shifts the economics of valuation and activity. The buyers most affected by the increase in rate will be those that rely heavily on financing through loans to complete an acquisition. Fortunately for sellers, interest rates being at historical lows has helped buyers compile large amounts of cash on their balance sheet which, when combined with acquirer confidence in the business and consumer marketplace, a taxation environment that can be viewed as business friendly, the ideal conditions for selling begin to take shape. It is important to take note that an increase in interest rates does not have as large of an immediate impact as the speed at which those interest rates increase. As the Federal Reserve continues to be relatively transparent with their intentions regarding gradually increasing interest rates, and with firms having taken advantage of historically low interest rates and compiling large amounts of cash on the balance sheet, the ideal time to sell a business, particularly one in the lower middle market space, will be sooner rather than later. As time goes on and increased rates continue to take a bite out of returns on investment, there will come a time when the balance will shift from a sellers’ market to one that is in favor of the buyer. 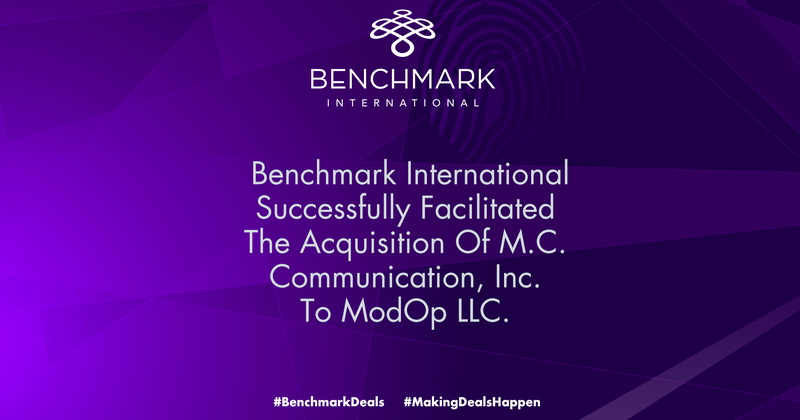 TAMPA, FL - International M&A specialist, Benchmark International, has successfully negotiated the sale of its client, MC2, Inc. ("MC2 ") to Stark Holdings America, Inc. ("Stark"), formerly known as Stark Technologies Group, Inc., a New York corporation. Based in Sanford, Florida, MC2 is recognized as Florida's automated control and security systems leader, with more than 20 years of on-site experience. MC2 has successfully evolved into a premier provider of engineered, state-of-the-art direct digital control, energy management systems, security access control, and closed circuit television systems, and lighting control for customers in both public and private sectors. Under President Roy G. Hoffman Jr.'s leadership, the company has successfully expanded and continues to increase its service footprint throughout the state of Florida. With a team of more than 50 knowledgeable engineers and technicians trained in a variety of automation and security systems, the company is prepared to deploy professionally designed systems to meet customers' specific needs. MC2' s flexibility allows the company to offer proprietary and non-proprietary systems, including integration services to third party systems, offering complete low voltage building solutions. 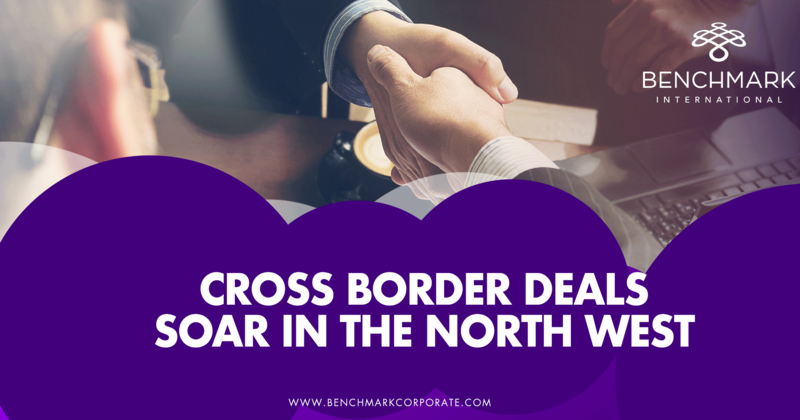 Mr Hoffman stated, "While Benchmark was involved throughout the process, their assistance on getting extra value built into the deal after the acquirer's initial valuation was received really demonstrated their unique expertise and command of the process." With more than 29 years in business, Stark is a North American provider of comprehensive intelligent building and energy management solutions. The company boasts over 250 employees and has been involved in projects across all 50 states, as well as 1 0 Canadian Provinces. While Stark continues to experience year-over-year revenue growth, the acquisition of MC2 provides Stark with an expanded geographic presence in the Florida market. 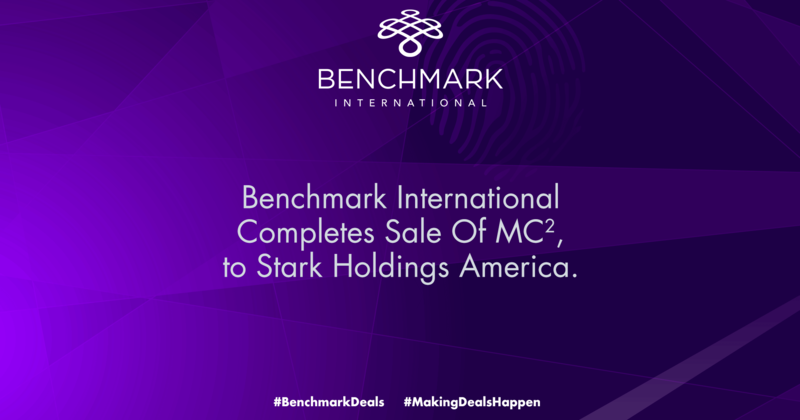 "MC2 is a compelling addition to Stark's platform, and we are truly honored to have worked alongside the MC2 team toward this successful outcome", said Trevor Talkie, Senior Associate at Benchmark International. 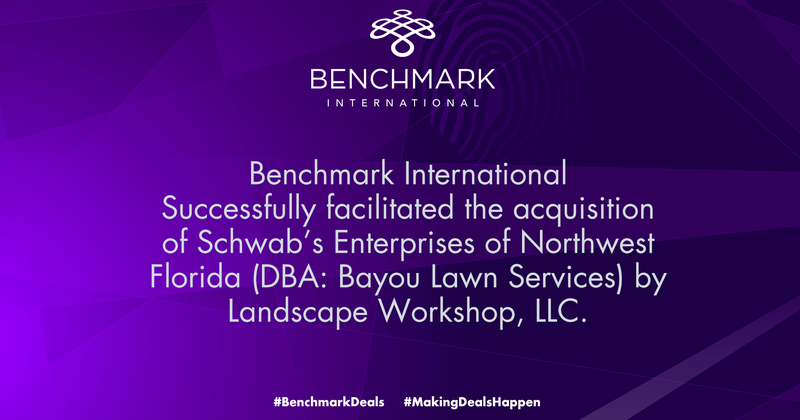 Leo VanderSchuur, Director at Benchmark International added, "Allowing both the seller and acquirer to prosper and benefit is always an ideal end result. 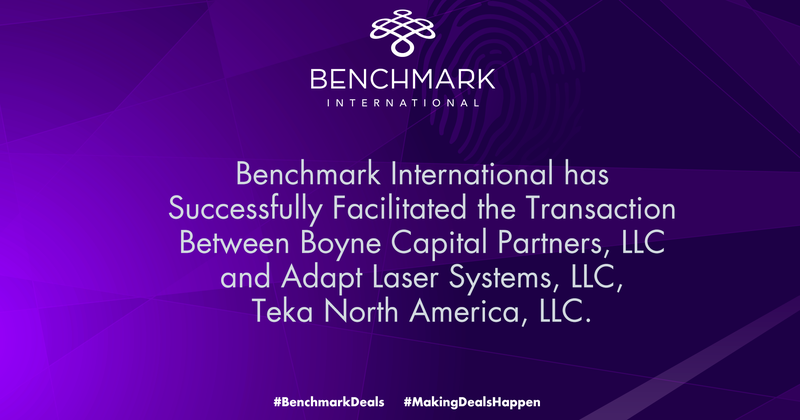 On behalf of Benchmark International, I'd like to wish both parties the best of luck moving forward." As your business grows you might find yourself doing increasingly more menial tasks to keep the business going. To ensure you have time to focus on the business, these tasks need to be delegated. Granted, this is easier said than done as you might want to stay in control rather than train somebody else to do them; however, if you continue to do this you are working in the business rather than on it. To ensure that you are the visionary and troubleshooter that you need to be, delegate work – you’ll be able to work on the bigger picture and your employees will appreciate the trust and responsibility you give to them. If you have got to a point where you have grown from a start-up then it might seem like the largest hurdle has been overcome. Nevertheless, you need to keep this momentum going to watch the company flourish. To do this, it’s a good idea to have plans and goals for the upcoming year, setting aside time to break down your goals into smaller steps with these to be actioned monthly, or even weekly. If these tasks are scheduled, and you ensure they are actioned, then this helps to make sure these goals are accomplished. If the day-to-day has become monotonous and the business is plateauing then you might want to encourage innovation to take the business in a new direction. To innovate it is useful to listen to both your customers and employees, as well as encourage your employees to take risks and think outside the box. This way, new ideas can be created and prevent the business from stagnating. Taking some time out of the business can help you to recharge. Whether this be scheduling time for yourself each evening, making sure you take time off at the weekend, or going on holiday, taking time out can help you to take a step away from the business and refresh, helping to stimulate fresh ideas. 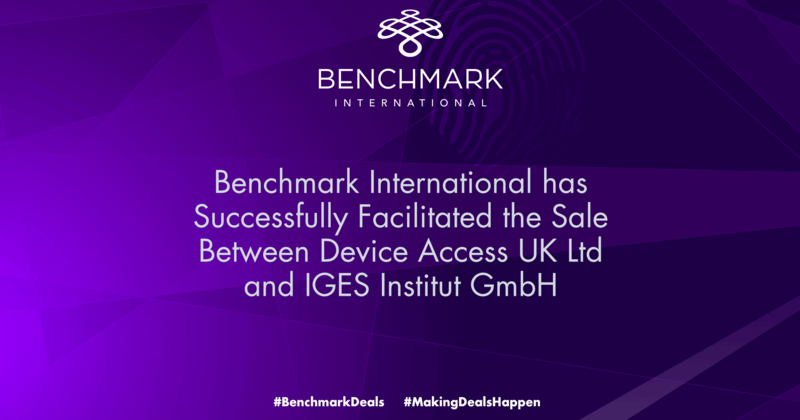 Benchmark International is pleased to announce the transaction between Southampton based consultancy, Device Access, and Berlin based research and consulting institution, IGES Institut. Founded in 2010 by Michael Branagan-Harris, Device Access supports medical device organisations across the world secure market access into the NHS. The IGES Institut, founded in 1980, is the core of the IGES group. It is a research and consulting institution for health and infrastructure, conducting over 2,000 research and consulting projects since its establishment. The acquisition allows IGES Group to continue its European expansion, servicing the growing global medical devices market in which Germany and the UK constitute core markets. Following the acquisition, Mr Branagan-Harris will continue to be the CEO of Device Access and will additionally lead IGES’ UK business activities as Country Manager, in order to bring the countries’ two markets closer together. 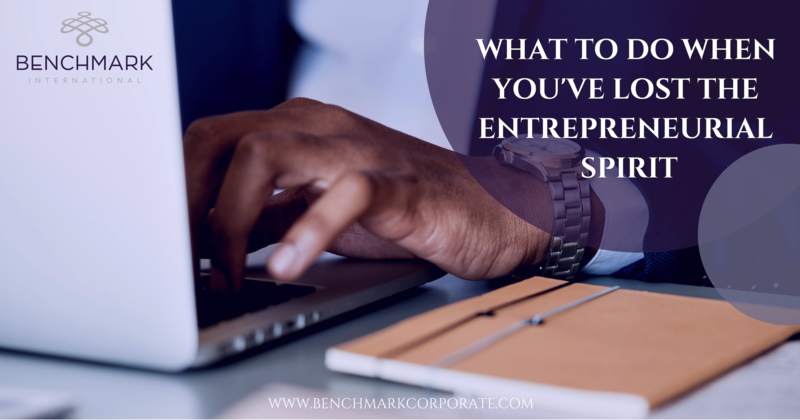 As a business owner you may be asking yourself how to keep your employees motivated and focused on the long-term objectives you have put in place for your business or you may be asking yourself how to raise additional capital to grow your business. There is a way to keep employees focused and aligned with the company’s growth objectives. Growing up in a family of entrepreneurs, I was always told that you better care of the things you actually own. Ever been to a nice hotel room and left the beds undone? The point here is that if employees take ownership of the business, they will have the business’ best interests at heart. One of the mechanisms used by many business owners as an exit strategy is an ESOP. An ESOP allows the continuity of an existing business and can be a great way for growth and expansion. Employee Stock Ownership Plan, or better known as an ESOP, is an employee benefit plan much like a 401(k) that allows your employees to take a real interest in the success of the company ownership. In other words, employees are allocated a number of ownership shares in a business this making them ‘owners.’ Traditionally, when the process of an ESOP begins, ownership shares are usually held in a trust until the employee decides to retire or leave the business, and at that point the company buys back the shares, keeping the ownership under one roof. The best part is the shareholders of your company wouldn’t be some outside investors that are only focused on their return, but they would be the people coming to the office everyday and putting in the work to make a difference. The success of your business will directly affect your employees/shareholders retirement plan, giving them an additional reason to increase productivity and profitability. Now, let’s say your employees are doing great but you want to take your business to its next growth stage. You may go to a bank to obtain a loan, which will result in high interest rates for a number of years. Your second option may be to seek out a financial investor, that could potentially result in losing a majority or controlling stake in your company. When companies bring in investors, they will want to see a return on their investment as quickly as possible and this can cause unwanted changes in company culture or operations. Luckily, there is a third option, creating an ESOP. This would allow you and your employees to stay in control and maintain the corporate culture you have created for your business over the many years it’s been in operation. You’re probably thinking how does an ESOP create capital for my company. At a simplified level, the business will have to be able to borrow money from a financial institution to fund the transaction of buying company shares or shares of a current owner. Since this would be considered a loan, the business will have to pay back both principal and interest; however, the way an ESOP is set up is as a pension plan, if you speak to your CPA or tax advisor they might be able to guide you on how these contributions could alleviate your tax burden. In addition, to the contributions to repay the ESOP loan, your tax advisor might be able to illustrate that there are other tax benefits the company can benefit from. Some of these include, cash contributions to the ESOP for the purpose of buying shares from employees or even to build up cash reserves could be tax deductible. 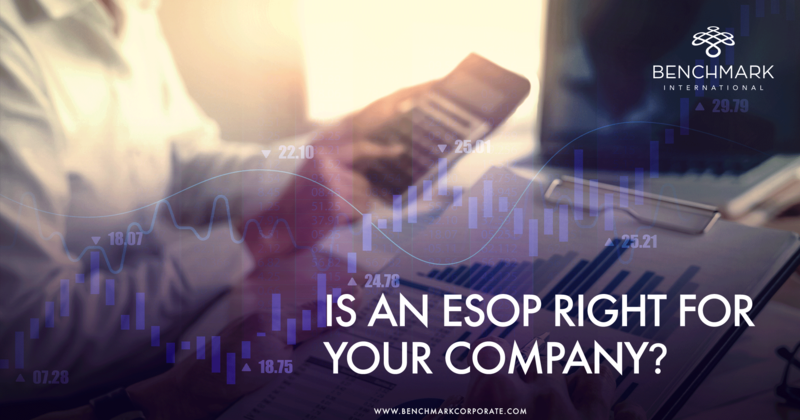 In S Corporations, the ownership held by the ESOP could be subjected to tax benefits, as the proportion held by the ESOP does not have to pay federal income tax. For example, if the ESOP owns 30% of the company, 30% of the profits from the business will not be included when paying taxes. There are restrictions on all contributions but these seldom cause an issue for the company. As a business owner who values the safety and well-being of your employees, before you decide on management buyout to increase capital or step away from your business, consider all the options on the table. 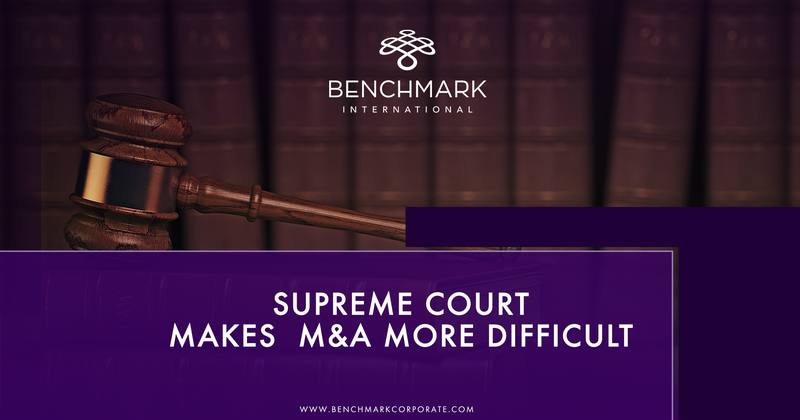 Benchmark International a leading lower middle market M&A firm is able to assistance you in this process when making tough decisions on the future of your company. We are here to support our client’s objectives and make an easy and graceful transition as you prepare for the step stage of your life, no matter where that might be. What if you’re a business owner in the process of transitioning your business or considering a transition? How do you handle it? Picture this for a moment: you’re up to bat with two outs, two runners on base and the Florida Championship on the line. Base hit up the middle scores one, possibly two, but if you pop up, ground out or strike out, it’s game over. If you could visualize yourself in that situation, chances are you’re feeling a little nervous. Especially if you’ve never been there before. What if you’re a business owner in the process of transitioning your business or considering a transition? You’re up to bat with two outs and two runners on base – how do you handle it? Ideally, we’d all like to confidently drill the first pitch deep into the outfield to win the game, but what happens when the thoughts and concerns about the transition and life after the transition get in the way? Things might not work out as planned. Will this wealth be enough to sustain me and my family? How do I know? What about taxes? What’s the impact to me? How in the world am I going to invest this money to serve me and my family? What about my legacy and charity – how does all this fit in? Finding the answers to these questions requires preparation. Unfortunately, many business owners are unprepared to address the complex financial decisions that need to be made for both themselves and their families both before and after the sale. Many would rather wait and leave the planning to another day. But a lack of planning and preparation has killed deals that should have closed, broken up families, and, in rare occasions, landed business owners in the hospital due to stress. Proper planning takes time, and having the right team of experienced professionals is critical to success. 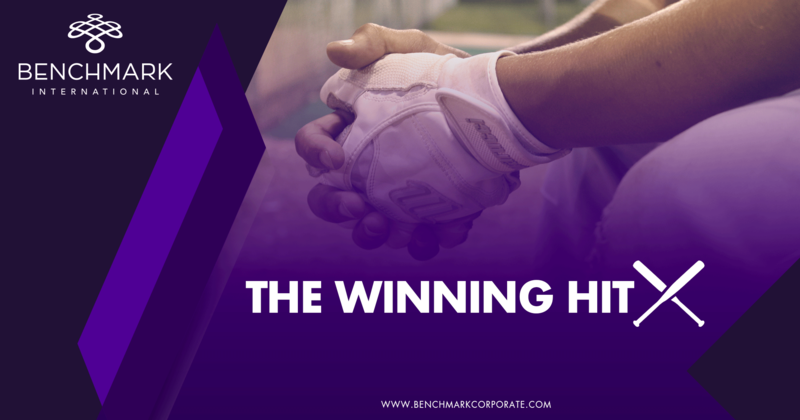 Armed with an experienced team who can assist with planning and preparation, you too can confidentially step up to the plate and win the game. For the last decade, private equity players have held the driver’s seat in looking at, winning auctions for, and acquiring lower middle market businesses in the United States. But early results for 2019 indicate this trend may be at an end. The family office has come to the fore and appears poised to become the dominant bidder and buyer in this market. Private equity funds have mandatory exit time frames imposed by their organizational documents and their agreements with their investors. A typical private equity fund has a life of about ten years so it must buy, grow, and then resell all of its investments in that time frame. Family offices, on the other hand, typically have no time horizon for re-selling. They are more often “buy and hold” acquirers. Private equity funds primarily invest “other people’s money”. Family offices invest their own money. While a family office will typically have a management team working for the capital provider and that has the appearance of a private equity-style management company, the management team’s relationships, compensation, career path, and rigidity of investment criteria are each vastly divergent from those of private equity funds. Private equity funds operate under some limitations as to the breathe of their investments - a tech fund can’t buy farmland – but they do seek diversification in very broad terms within these limitations. Family offices tend to have a narrower focus. They hew close to the Warren Buffet mantra that investors should only buy stocks within their "circle of competence." A family office that has made money in landscaping is likely only to look at landscaping businesses and if the family made its money in commercial landscaping, to only look at commercial landscaping businesses. 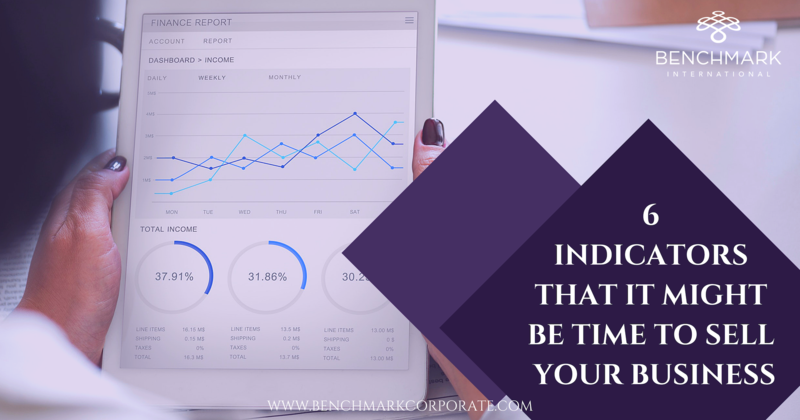 As a result, they tend to come across to Benchmark Internationals’ clients as more knowledgeable about their business. Also owing to their tighter range of interest and the fact that they do not have outside investor to whom they owe fiduciary duties, they tend to move faster, perform less diligence, and produce shorter contracts. Over the last ten years, as multiple have increased, private equity funds and trade buyers have ratcheted up their due diligence to levels our clients find very painful. This is understandable as higher multiple mean more risks for these buyers. But family offices seem more comfortable with this heightened risk and rely on their expertise in the narrower industry to alleviate the risk other buyers reduce via diligence. Family offices also tend to use less debt in their deals than do private equity funds. Perhaps as a result of this fact, or maybe not, they tend to use their existing debt facilities to provide the extra leverage needed to put in competitive bids. As a result, the lenders due diligence is either greatly reduced or eliminated from the acquisition process. This also increases the speed to close and reduced the stress for sellers. When a private equity fund, or even a typical trade buyer, sets up a new transaction, they also set up a new lending arrangement and the bank providing the debt sends in its own diligence team to investigate the deal and the company being acquired. Double the diligence, double the fun! Because a family office’s money is coming from one source as opposed to many, they tend to seek out smaller opportunities than do private equity funds. There are some very small private equity funds these days and there are also some rather large family offices now. But in general, the managers at a family office are more accustomed to dealing with smaller business, more owner-operated businesses, and businesses with less data to share during the due diligence process. 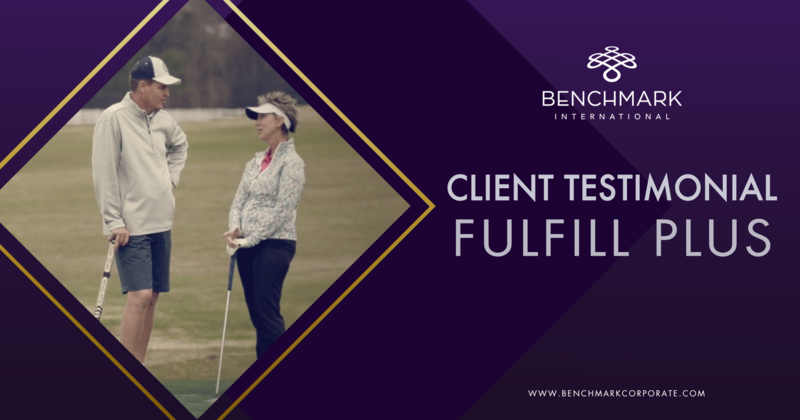 As a result, our clients often find them easier to work with and have more interest in working with them on an ongoing basis following the closing. Private equity funds often have a mechanism in place to have their “deal costs” covered by third parties. Deal costs primarily consist of due diligence costs, legal fees, and travel. It is not uncommon to see a private equity funds deal costs amount to over 5% of the transaction value. Family offices, on the other hand, have no one to turn to for their deal costs. This has two favorable results for sellers. First, they spend less on the process, making it shorter and easier. Second, their certainty of close is higher. While private equity funds can somewhat mitigate the costs of a “blown deal,” family offices only have one pocket to pull from – their own (or, in other words, their boss’s personal pocket). The characteristic that is probably self-evident by this point is the higher certainty of close. Family offices know the market batter, they have less bandwidth to use time inefficiently, they have more discretion, they are less reliant on banks, and they don’t want to waste their own money on blown deals. They are thus more cautious, put in fewer bids, and call things off much sooner than other buyer types. In short, if they are proceeding, they are more serious than they average buyer. They are harder to find. They do not have to register with the SEC. There is no secret club they belong to. They are too short-handed to attend many conferences. Many even enjoy anonymity and don’t even have websites. This last characteristic is what makes selling to family offices tricky. Any broker can produce a Rolodex of private equity funds. In fact, an impressive one could be produced from scratch in a matter of hours. Furthermore, because their focuses tend to be so narrow, the first 100 family offices in the Rolodex would probably not be a good fit for any given business but a similar list of private equity funds would probably produce a few interested buyers in most any growing business. A broker is either into the family office world or they are not. There is no break through moment in this regard. It requires years of dedicated effort to identify and establish relationships with these hidden gems. It requires dozens of researchers and outreach efforts. It also requires having an inventory of businesses for sale that keeps these buyers interested. Brokers focused on larger deals and boutique brokers lacking global reach simply can’t devote the time and energy necessary to gain access to this strengthening pool of buyers. 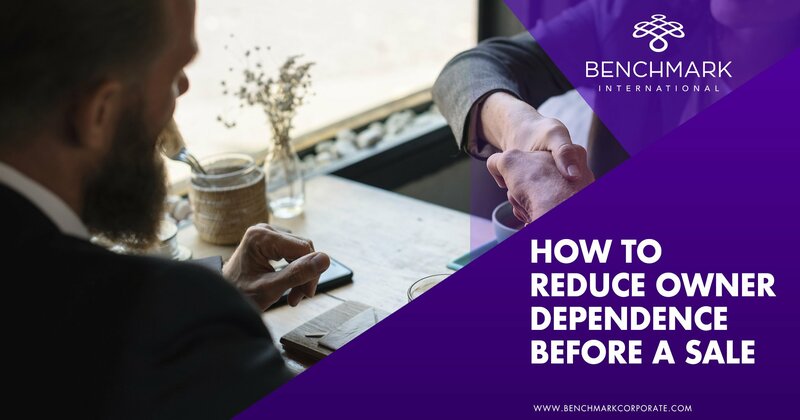 Only brokerages such as Benchmark International have the capability to do so and many of those with the capability have simply not made the effort. 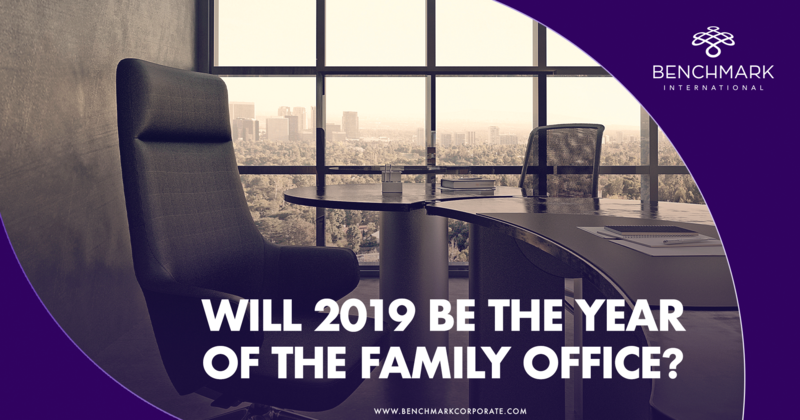 Our family office relationships are continually growing and in 2019 these efforts have rewarded our clients handsomely. Keep your eyes open. I bet you’ll soon start to see the Wall Street Journal talking about family offices and the rise of the family office. 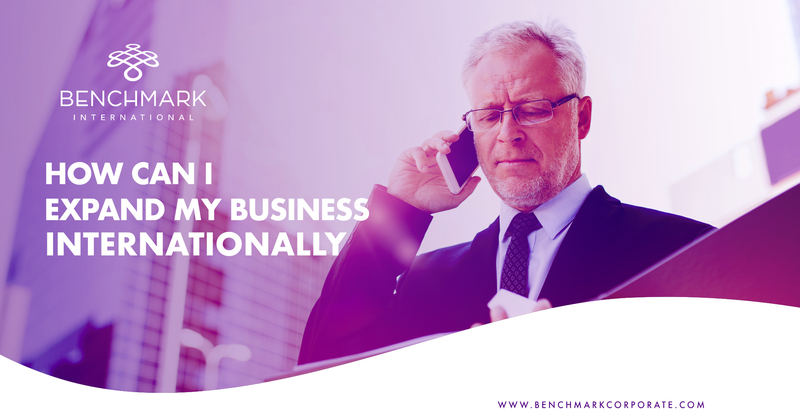 When you do, remember that you heard it here first and Benchmark International is your gateway to those buyers. CBInsights has published its annual survey on 2018 corporate venture capital (CVC). Globally, 2,740 deals were completed raising $52.95 billion. 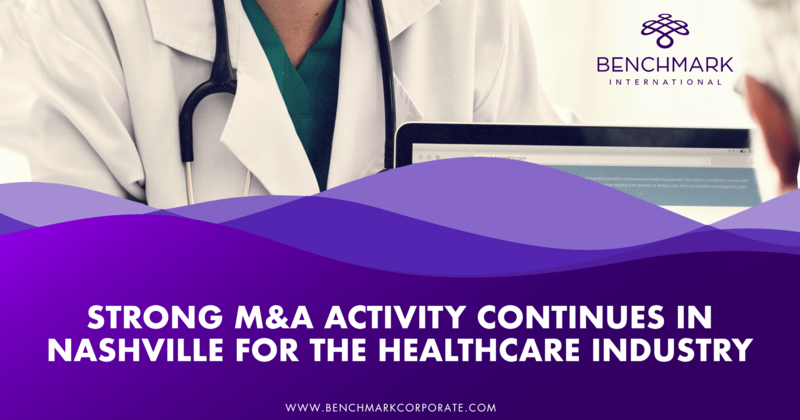 This equated to an increase in capital raised by approximately 47% over 2017 and deals increased 32% over the same period. The average CVC deal size reached an all-time high of $26.3 million. Looking at quarterly trends, Q4 2018 saw the highest number of active CVCs ever, with 429 CVCs investing in the quarter. This number represents 59% year-over-year growth, up from 270 active corporate investors in Q4 2017. By sector, CVC investments in internet start-ups and healthcare companies increased significantly. While deal activity also increased in Asia, the most noteworthy increase came in the United States with 1,046 deals completed in 2018.